In a reflection of the changes taking place in the global economy, new battle lines are being drawn by the global cash management banks, particularly in regions like Asia and Africa. The banks are increasingly investing, stepping up to the plate to cash in on the economic growth and increased transaction volumes in those regions. 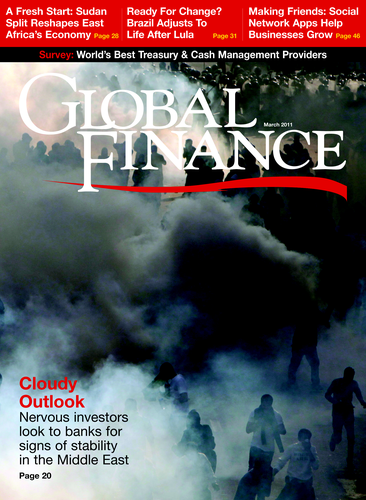 At the same time, local and regional providers that may not have the global reach of a Citi or HSBC are leveraging their local-market knowledge, distribution networks and investment in technology to come up with truly innovative treasury and cash management solutions that equal and, in some cases, surpass those developed by the global banks. A universal theme across this year’s awards is the increasing level of investment from banks in accounts receivable and liquidity management solutions. A number of banks have already launched or are rolling out global liquidity management platforms to provide their customers with a more consistent experience globally and greater understanding of and control over their global cash, liquidity and investments. In a low-interest-rate environment banks are also investing heavily in their short-term investment and money market functionality to provide companies with a single point of access for trading, monitoring and analyzing their investments. 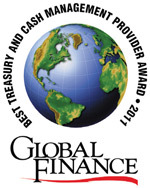 In this year’s awards, Global Finance has picked the cash management banks and treasury management software and service providers we believe have successfully combined geographical reach, product innovation, investment in technology and local market knowledge to meet the increasingly sophisticated and complex regional and global needs of their customers. Winners were selected using a range of subjective and objective criteria including companies’ investment in new and innovative technologies, profitability, product depth and breadth, market share and regional coverage. Our winners reflect those companies that are innovating beyond “bread and butter” treasury and cash management capabilities to provide real value-added solutions to their banking and corporate customers. It is no longer just about being a strong provider in a particular region but increasingly about having the ability to service customers in a range of locations, each with its own regulatory requirements, market infrastructure and challenges.